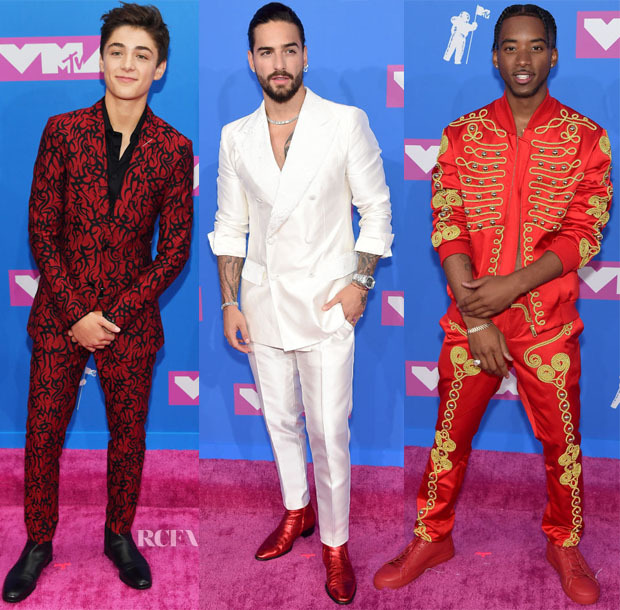 Not to let the girls completely take over the red — well, pink — carpet at the 2018 MTV VMAs on Monday (August 20) in New York City, the guys showed up to the party, as well. Asher Angel: It’s hard to believe Asher’s only 15, when he has such a cool command of style as seen in this Dior Men patterned suit. Maluma: White, satiny looks are tricky — on both males and females. But, there’s an “E” for effort to be given out for this Dolce & Gabbana suit and red-metallic Saint Laurent rocker boots. Algee Smith: With this decorative athleisure aesthetic, there would be no missing Algee in his Moschino tracksuit with gold rope embellishment artfully construed in a semi-skeleton motif. FACTO shoes completed his look. Gucci Mane: This pink, striped jacket emblazoned with green dragons is not for the faint of heart — nor is it easy to pull off. But, Gucci Mane rapped it out in top form with this high-octane twist on the tuxedo. 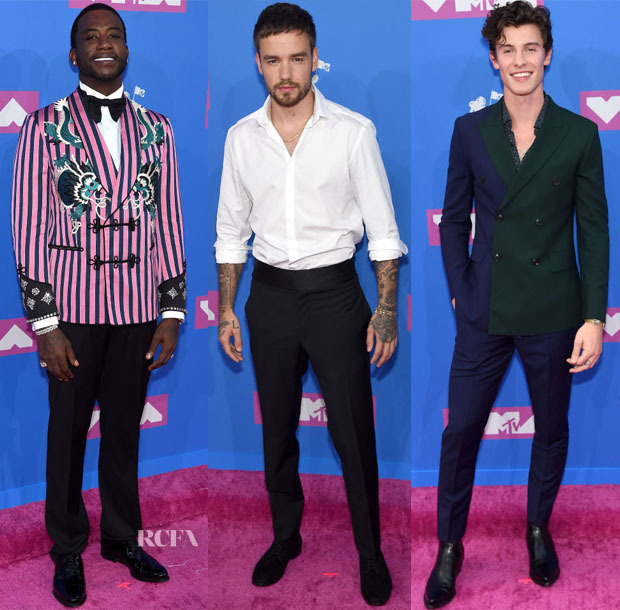 Liam Payne: The Lanvin white button-down shirt and dress pants were basic, but it’s Liam’s ink and steely stare that ratcheted up the look quite a few levels. Shawn Mendes: With the split-personality blue and forest-green jacket, this Paul Smith look had hipster cool-kid written all over it.